Cape Breton Island (French: île du Cap-Breton—formerly île Royale, Scottish Gaelic: Eilean Cheap Breatuinn, Míkmaq: Únamakika, simply: Cape Breton) is an island on the Atlantic coast of North America. It likely corresponds to the French word "Breton," referring to Brittany. Cape Breton Island is part of the province of Nova Scotia, Canada. Although physically separated from the Nova Scotia peninsula by the Strait of Canso, it is artificially connected to mainland Nova Scotia by the Canso Causeway. The island is located east-northeast of the mainland with its northern and western coasts fronting on the Gulf of Saint Lawrence; its western coast also forming the eastern limits of the Northumberland Strait. The eastern and southern coasts front the Atlantic Ocean; its eastern coast also forming the western limits of the Cabot Strait. Its landmass slopes upward from south to north, culminating in the highlands of its northern cape. 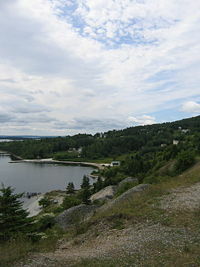 A saltwater estuary, Bras d'Or Lake, dominates the center of the island. As a French colony it was known as Île Royale, later taking the name of its eastern cape. The island is believed to have been the first land visited by John Cabot on his 1497–1498 voyage. In 1758, the island was captured by the British; formal cession was made in the 1763 Treaty of Paris, which marked the beginning of an extensive period of British dominance outside of Europe. Cape Breton Island was joined to Nova Scotia but in 1784, became a separate British crown colony and remained so for the next 36 years. It was rejoined to Nova Scotia in 1820. In the early twenty-first century the "Province of Cape Breton Island," a political movement which calls for the re-establishment of the Province of Cape Breton Island to be governed separately from the Province of Nova Scotia, was formed. Its residents can be grouped into five main cultures; Scottish, Mi'kmaq, Acadian, Irish, and English. It is primarily recognized for its Scottish Gaelic heritage. The island contains five reserves of the Mi'kmaq Nation. The Islanders are proud of both their ancestral heritages and the beauty of their island, the scenery of which draws nearly half a million visitors each year. 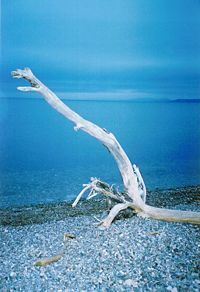 Cape Breton Island's first residents were likely Maritime Archaic Indians, ancestors of the Mi'kmaq Nation, the later of whom inhabited the island at the time of European discovery. Giovanni Caboto (John Cabot) reportedly visited the island in 1497 to become the first Renaissance European explorer to visit present-day Canada. However, historians are unclear as to whether Cabot first visited Newfoundland or Cape Breton Island. This believed discovery is commemorated by Cape Breton's Cabot Trail. On February 8, 1631, Charles I granted Cape Breton Island to Robert Gordon of Lochinvar and his son Robert. The island saw active settlement by France with the island being included in the colony of Acadia. A French garrison was established in the central eastern part at Ste-Anne in the early 18th century, before relocating to a much larger fortification at Louisbourg in order to improve defenses at the entrance to the Gulf of St. Lawrence and defend France's fishing fleet on the Grand Banks. They also built the Louisbourg Lighthouse in 1734, the first lighthouse in Canada and one of the first in North America. The French named the island "Île Royale." It remained part of colonial France until it was ceded to Britain under the Treaty of Paris in 1763. Britain merged the island with its adjacent colony of Nova Scotia (present day peninsular Nova Scotia and New Brunswick). Mi'kmaq camp on Cape Breton Island, photographed by Paul-Émile Miot in 1857. The coastline of Bras d'Or Lake at Marble Mountain, Inverness Co.. Some of the first British-sanctioned settlers to the island following the Seven Years' War were Irish, although upon settlement, they merged with local French communities to form a culture rich in both music and tradition. From 1763 to 1784 the island was administratively part of the colony of Nova Scotia and governed from Halifax. The first permanently settled Scottish community on Cape Breton Island was Judique, settled in 1775 by Michael Mor MacDonald. He spent his first winter using his upside-down boat for shelter, which is reflected in the architecture of the village's Community Center. He composed a song about the area called "O's alainn an t-aite," or "Fair is the Place." In 1784, Britain split the colony of Nova Scotia into three separate colonies: New Brunswick, Cape Breton Island, and present-day peninsular Nova Scotia, in addition to the adjacent colonies of St. John's Island (renamed Prince Edward Island in 1798) and Newfoundland. The colony of Cape Breton Island had its capital at Sydney on its namesake harbor fronting on Spanish Bay and the Cabot Strait. Its first Lieutenant-Governor was Joseph Frederick Wallet DesBarres (1784–1787) and his successor was William Macarmick (1787). From 1799 to 1807, the military commandant was John Despard, brother of Edward. An order forbidding the granting of land in Cape Breton, issued in 1763, was removed in 1784. The mineral rights to the island were given over to the Crown by an order-in-council. The British government had intended that the Crown take over the operation of the mines when Cape Breton was made a colony, but this was never done, probably because of the rehabilitation cost of the mines. The mines were in a neglected state, caused by careless operations dating back at least to the time of the final fall of Louisbourg. In 1820, the colony of Cape Breton Island, and Prince Edward Island were merged for the second time with Nova Scotia, Prince Edward Island was later removed from Nova Scotia rule. This development was one of the factors which led to large-scale industrial development in the Sydney Coal Field of eastern Cape Breton County. By the late nineteenth century, as a result of the faster shipping, expanding fishery, and industrialization of the island, exchanges of people between the island of Newfoundland and Cape Breton increased, beginning a cultural exchange that continues to this day. During the first half of the nineteenth century, Cape Breton Island experienced an influx of Highland Scots numbering approximately 50,000 as a result of the Highland Clearances. Today, the descendants of the Highland Scots dominate Cape Breton Island's culture, particularly in rural communities. To this day Canadian Gaelic is still the first language of a number of elderly Cape Bretoners. A campaign of violence and intimidation by the provincial school board led to the near extermination of Gaelic culture. The growing influence of English-dominated media from outside the Scottish communities saw the use of this language erode quickly during the twentieth century. Many of the Scots who immigrated there were either Roman Catholics or Presbyterians, which can be seen in a number of island landmarks and place-names. The 1920s were some of the most violent times in Cape Breton. The decade was marked by several severe labor disputes. The famous murder of William Davis by strike breakers, and the seizing of the new waterford power plant by striking miners led to a major union sentiment that continues to the present in some circles. In coal mining towns Davis Day is celebrated to commemorate the deaths of miners at the hands of the coal companies. Tourism promotions beginning in the 1950s recognized the importance of the Scottish culture to the province, and the provincial government began encouraging the use of Gaelic once again. The establishment of funding for the Gaelic College of Celtic Arts and Crafts and formal Gaelic language instruction in public schools are intended to address the near-loss of this culture to English assimilation. The turn of the twentieth century saw Cape Breton Island at the forefront of scientific achievement with the now-famous activities launched by inventors Alexander Graham Bell and Guglielmo Marconi. Following his successful invention of the telephone and being relatively wealthy, Bell acquired land near Baddeck in 1885, largely due to surroundings reminiscent of his early years in Scotland. He established a summer estate complete with research laboratories, working with deaf people—including Helen Keller—and continued to invent. Baddeck was the site of his experiments with hydrofoil technologies as well as the Aerial Experiment Association, financed by his wife, which saw the first powered flight in the British Empire when the AEA Silver Dart took off from the ice-covered waters of Bras d'Or Lake. Bell also built the forerunner to the iron lung and he experimented with breeding sheep. Marconi's contributions to Cape Breton Island were somewhat less than Bell's as he merely used the island's geography to his advantage in transmitting the first North American trans-Atlantic radio message from a station constructed at Table Head in Glace Bay to a receiving station at Poldhu in Cornwall, England. The island measures 10,311 square kilometers in area (3,981 sq mi), making it the 75th largest island in the world and Canada's 18th largest island. Cape Breton Island is composed mainly of rocky shores, rolling farmland, glacial valleys, barren headlands, mountains, woods and plateaus. Geological evidence suggests that at least part of the island was originally joined with present-day Scotland and Norway, now separated by millions of years of continental drift. The northern portion of Cape Breton Island is dominated by the Cape Breton Highlands, commonly shortened to simply the "Highlands," which are an extension of the Appalachian mountain chain. The Highlands comprise the northern portions of Inverness and Victoria counties. In 1936 the federal government established the Cape Breton Highlands National Park covering 949 km² (366 sq mi) across the northern third of the Highlands. The Cabot Trail scenic highway also encircles the coastal perimeter of the plateau. Cape Breton Island's hydrological features include the Bras d'Or Lake system, a salt-water fjord at the heart of the island, and freshwater features including Lake Ainslie, the Margaree River system, and the Mira River. Innumerable smaller rivers and streams drain into the Bras d'Or Lake estuary and onto the Gulf of St. Lawrence and Atlantic coasts. Cape Breton Island is joined to the mainland by the Canso Causeway, which was completed in 1955, enabling direct road and rail traffic to and from the island, but requiring marine traffic to pass through the Canso Canal at the eastern end of the causeway. Cape Breton Island is divided into four counties: Cape Breton, Inverness, Richmond, and Victoria. The Sydney waterfront, focal point of the largest population center on Cape Breton Island. Cape Breton's unspoiled scenery is a tourist draw. 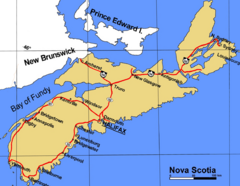 The island is divided into four of Nova Scotia's eighteen counties: Cape Breton, Inverness, Richmond, and Victoria. Approximately 72 percent of the island's population is located in the Cape Breton Regional Municipality which includes all of Cape Breton County and is often referred to as Industrial Cape Breton, given the history of coal mining and steel manufacturing in this area. The island's residents can be grouped into five main cultures; Scottish, Mi'kmaq, Acadian, Irish, and English, with respective languages—Gaelic, Mi'kmaq, French, and English. English is now the primary spoken language, though Mi'kmaq, Gaelic and French are still heard. The island contains five reserves of the Mi'kmaq Nation, these being: Eskasoni, Membertou, Wagmatcook, We'kopaq/Waycobah, and Potlotek/Chapel Island. Eskasoni is the largest in both population and land area. Later migrations of Black Loyalists, Italians, and Eastern Europeans mostly settled in the eastern part of the island around the Industrial Cape Breton region. The population of Cape Breton Island has been in decline for almost two decades with an increasing population exodus in recent years due to economic conditions. Cape Breton Island has two major coal deposits: The Sydney Coal Field in the southeastern part of the island along the Atlantic Ocean drove the Industrial Cape Breton economy throughout the nineteenth and twentieth centuries—until after World War II its industries were the largest private employers in Canada; the Inverness Coal Field in the western part of the island along the Gulf of St. Lawrence is significantly smaller but hosted several mines. Sydney has traditionally been the main port, with various facilities in a large, sheltered, natural harbor. It is the island's largest commercial center and home to the island's daily newspaper, the Cape Breton Post, as well as its only active television studio, CJCB-TV, and several radio stations. The Marine Atlantic terminal at North Sydney is the terminal for large ferries traveling to Channel–Port aux Basques and seasonally to Argentia on the island of Newfoundland. Point Edward on the west side of Sydney Harbor is the location of Sydport, a former navy base (HMCS ProtectorTemplate:WP Ships HMCS instances) now converted to commercial use. The Canadian Coast Guard College is located nearby at Westmount. Petroleum, bulk coal, and cruise ship facilities are also located in Sydney Harbor. Glace Bay is the second largest urban community in population and was the island's main coal mining center until its last mine ceased operation in the 1980s. Glace Bay served as the hub of the Sydney & Louisburg Railway and also as a major fishing port. At one time, Glace Bay was known as the largest town in Nova Scotia, based on population. Port Hawkesbury has risen to prominence since the completion of the Canso Causeway and Canso Canal created an artificial deep-water port, allowing extensive petrochemical, pulp and paper, and gypsum handling facilities to be established. The Strait of Canso is completely navigable to St. Lawrence Seaway-max vessels, and Port Hawkesbury is open to the deepest-draught vessels on the world's oceans. Large marine vessels may also enter Bras d'Or Lake through the Great Bras d'Or channel whereas small craft have the additional use of the Little Bras d'Or channel or St. Peters Canal. The St. Peters Canal is no longer used by commercial shipping on Cape Breton Island but is an important waterway for recreational vessels. The industrial Cape Breton area faced several challenges with the closure of the Cape Breton Development Corporation's (DEVCO) coal mines and the Sydney Steel Corporation's (SYSCO) steel mill. In recent years the Island's residents have been attempting to diversify the area economy by investing in tourism developments, call centers, and small businesses, as well as manufacturing ventures in such fields as auto parts, pharmaceuticals, and window glazings. 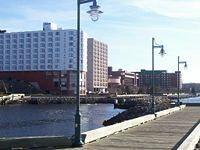 While the Cape Breton Regional Municipality is in transition from an industrial to a service-based economy, the rest of Cape Breton Island outside of the industrial area surrounding Sydney-Glace Bay has been more stable, with a mixture of fishing, forestry, small-scale agriculture, and tourism. 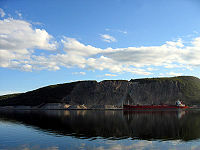 A bulk carrier in the Strait of Canso docked at the Martin Marietta Materials quarry located at Cape Porcupine. The photo is taken from Cape Breton side of the Canso Causeway. Tourism in particular has grown throughout the post-Second World War era, especially the growth in vehicle-based touring, which was furthered by the creation of the Cabot Trail scenic drive. Cape Breton Island tourism marketing places a heavy emphasis on its Scottish Gaelic heritage through events such as the Celtic Colours Festival, held each October, as well as promotions through the Gaelic College of Celtic Arts and Crafts. A popular attraction for tourists is not on the land, but in the water: Whales. Whale-watching cruises are operated by numerous vendors from Baddeck to Cheticamp. The most popular species of whale found in Cape Breton's waters is the Pilot whale. The primary east-west road on the island is Highway 105, the Trans-Canada Highway, although Trunk 4 is also heavily used. Highway 125 is an important arterial route around Sydney Harbour in the Cape Breton Regional Municipality. The Cabot Trail, circling the Cape Breton Highlands, and Trunk 19, along the western coast of the island, are important secondary roads. Railway connections between the port of Sydney to Canadian National Railway in Truro are maintained by the Cape Breton and Central Nova Scotia Railway. The Cabot Trail is a scenic road circuit around and over the Cape Breton Highlands with spectacular coastal vistas; over 400,000 visitors drive the Cabot Trail each summer and fall. Coupled with Fortress Louisbourg, it has driven the growth of the tourism industry on the island in recent decades. The Condé Nast travel guide has rated Cape Breton Island as one of the best island destinations in the world. Cape Breton fiddling is a lively regional violin style which falls within the Celtic music idiom. Cape Breton Island's fiddle music was brought to North America by Scottish immigrants during the Highland Clearances. These immigrants were primarily from Gaelic-speaking regions in the Scottish Highlands and the Outer Hebrides. Although fiddling has changed considerably since this time in Scotland, it is widely held that the tradition of Scottish fiddle music has been better preserved in Cape Breton. Dance styles associated with the music are Cape Breton step dancing, Cape Breton square dancing (Iona style and Inverness style), and highland dancing. In 2005, as a tribute to the area's traditional music, the construction of a tourism center and the world's largest fiddle and bow was completed on the Sydney waterfront. ↑ Table from Statistics Canada - CBRM (Census Profile, 2011 Census). Retrieved May 29, 2012. ↑ Table from Statistics Canada (Census Profile, 2011 Census) Retrieved May 29, 2012. ↑ Francisco de Souza, Tratado das Ilhas Novas, 1570. Retrieved May 30, 2012. Bollan, William. The Importance and Advantage of Cape Breton. New York: Johnson Reprint Corp., 1966. OCLC 3522193. Chiasson, Paul. The Island of Seven Cities: Where the Chinese Settled When They Discovered America. New York: St. Martin's Press, 2006. ISBN 9780312362058. Morgan, Robert J. Rise Again! The Story of Cape Breton Island. Toronto: Breton Books, 2008. ISBN 1895415810. Natural Resources Canada. Sea Islands. Retrieved December 20, 2008. Souza, Francisco de. Tratado das Ilhas Novas, 1570. Retrieved May 30, 2012. Statistics Canada. Population Counts, Land Area, Population Density and Population Rank, for Canada, Provinces and Territories, and Census Divisions, 2001 Census—100% Data. Retrieved December 20, 2008. Statistics Canada. Population Counts, Land Area, Population Density and Population Rank, for Canada, Provinces and Territories, Census Divisions and Census Subdivisions (Municipalities), 2001 Census. Retrieved December 20, 2008. 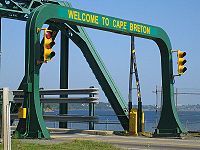 History of "Cape Breton Island"
This page was last modified on 9 January 2017, at 16:43.